Expository Midrash to the first book of the Pentateuch, assigned by tradition to the amora Hoshaiah, commonly Osha'yah, who flourished in the third century in Palestine. The Midrash forms a haggadic commentary on the whole of Genesis, in keeping with the character of the Midrashic exegesis demanded by that age. In a continuous sequence, broken only toward the end, the Biblical text is expounded verse for verse, often word forword; only genealogic passages, and such as furnish no material for exposition (as the reiterated account of Abraham's servant in Gen. xxiv. 35-48), are omitted. The Bereshit Rabbah contains many simple explanations of words and sentences, often in the Aramaic language, suitable for the instruction of youth; and also the most varied haggadic expositions popular in the public lectures of the synagogues and schools. According to the material or the sources at the disposal of the editor of the Midrash, he has strung together various longer or shorter explanations and haggadic interpretations of the successive passages, sometimes anonymously, sometimes citing the author. Again, he adds to the running commentary longer haggadic disquisitions or narratives, connected in some way with the verse in question, or with one of the explanations of it—a method not unusual in the Talmud and in other Midrashim. The first chapters of Genesis, on the creation of the world and of man, naturally furnished especially rich material for this mode of exegesis. Whole sections are devoted to comments upon one or two verses of the text. Many references to contemporary philosophical thought are made with the purpose of refuting the opinions of the heretics. References to contemporaneous conditions and historical events also occur; indeed, it is characteristic of the Midrash to view the personages and conditions of the Bible by the light of contemporary history. Though the stories embraced in Genesis furnished little occasion for comments on legal topics, Bereshit Rabbah contains a few short halakic sentences and quotations taken from the Mishnah and other sources. This Midrash is eminently rich in sublime thoughts and finely worded sentences, in all kinds of parables, in foreign words, especially Greek, used freely and intentionally for the sake of elegance of diction. Some Greek words, to be found nowhere else in Jewish literature, have been preserved in the Bereshit Rabbah (e.g., , κόνδυλος, section i. in 'Aruk and MSS. ; , 'Ελευθερόπολις, section xli. (xlii.) in 'Aruk, corrupted in editions). 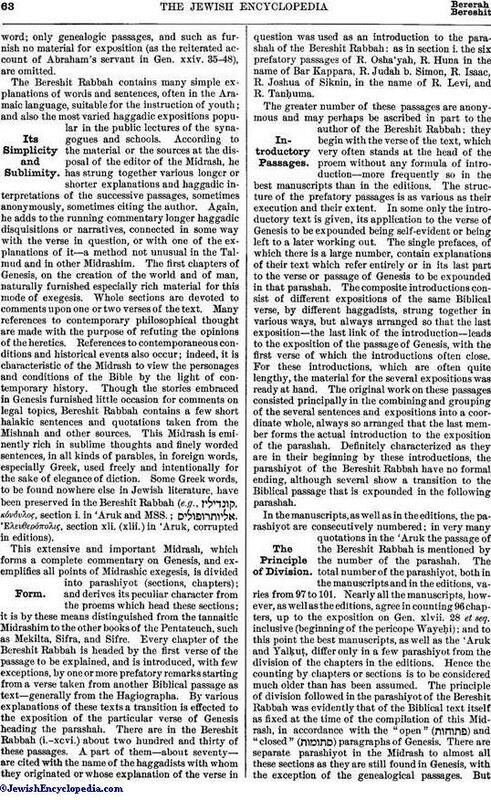 This extensive and important Midrash, which forms a complete commentary on Genesis, and exemplifies all points of Midrashic exegesis, is divided into parashiyot (sections, chapters); and derives its peculiar character from the proems which head these sections; it is by these means distinguished from the tannaitic Midrashim to the other books of the Pentateuch, such as Mekilta, Sifra, and Sifre. Every chapter of the Bereshit Rabbah is headed by the first verse of the passage to be explained, and is introduced, with few exceptions, by one or more prefatory remarks starting from a verse taken from another Biblical passage as text—generally from the Hagiographa. By various explanations of these texts a transition is effected to the exposition of the particular verse of Genesis heading the parashah. There are in the Bereshit Rabbah (i.-xcvi.) about two hundred and thirty of these passages. A part of them—about seventy—are cited with the name of the haggadists with whom they originated or whose explanation of the verse in question was used as an introduction to the parashah of the Bereshit Rabbah: as in section i. the six prefatory passages of R. Osha'yah, R. Huna in the name of Bar Kappara, R. Judah b. Simon, R. Isaac, R. Joshua of Siknin, in the name of R. Levi, and R. Tanḥuma. The greater number of these passages are anonymous and may perhaps be ascribed in part to the author of the Bereshit Rabbah; they begin with the verse of the text, which very often stands at the head of the proem without any formula of introduction—more frequently so in the best manuscripts than in the editions. The structure of the prefatory passages is as various as their execution and their extent. In some only the introductory text is given, its application to the verse of Genesis to be expounded being self-evident or being left to a later working out. The single prefaces, of which there is a large number, contain explanations of their text which refer entirely or in its last part to the verse or passage of Genesis to be expounded in that parashah. The composite introductions consist of different expositions of the same Biblical verse, by different haggadists, strung together in various ways, but always arranged so that the last exposition—the last link of the introduction—leads to the exposition of the passage of Genesis, with the first verse of which the introductions often close. For these introductions, which are often quite lengthy, the material for the several expositions was ready at hand. The original work on these passages consisted principally in the combining and grouping of the several sentences and expositions into a coordinate whole, always so arranged that the last member forms the actual introduction to the exposition of the parashah. Definitely characterized as they are in their beginning by these introductions, the parashiyot of the Bereshit Rabbah have no formal ending, although several show a transition to the Biblical passage that is expounded in the following parashah. In the manuscripts, as well as in the editions, the parashiyot are consecutively numbered; in very many quotations in the 'Aruk the passage of the Bereshit Rabbah is mentioned by the number of the parashah. The total number of the parashiyot, both in the manuscripts and in the editions, varies from 97 to 101. Nearly all the manuscripts, however, as well as the editions, agree in counting 96 chapters, up to the exposition on Gen. xlvii. 28 et seq. inclusive (beginning of the pericope Wayeḥi); and to this point the best manuscripts, as well as the 'Aruk and Yalḳuṭ, differ only in a few parashiyot from the division of the chapters in the editions. Hence the counting by chapters or sections is to be considered much older than has been assumed. The principle of division followed in the parashiyot of the Bereshit Rabbah was evidently that of the Biblical text itself as fixed at the time of the compilation of this Midrash, in accordance with the "open" ( ) and "closed" ( ) paragraphs of Genesis. There are separate parashiyot in the Midrash to almost all these sections as they are still found in Genesis, with the exception of the genealogical passages. 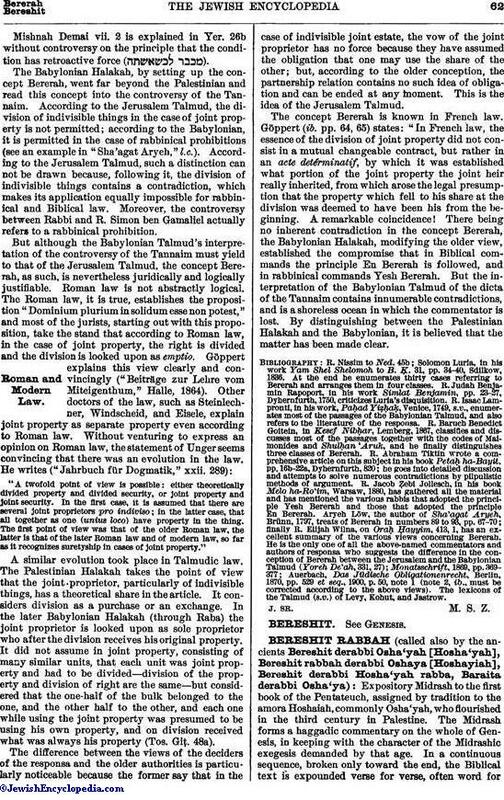 Butthere are parashiyot that bear evidences of relation to the pericopes ("sedarim") of the Palestinian triennial cycle, and a careful investigation of these may lead to the discovery of an arrangement of sedarim different from that heretofore known from old registers. However, there are parashiyot, as mentioned above, especially in the beginning of the Midrash, in which only one or a few verses at a time are expounded. The sedarim of the customary one-year cycle are not regarded at all in the divisions of the Bereshit Rabbah, neither are they marked in the best manuscripts or in the editio princeps of the Midrash; the parashiyot, therefore, can not be regarded as mere subdivisions of the sedarim, as which they appear in later editions of this Midrash. Far more difficult than any question concerning the outward form of the Bereshit Rabbah is that of deciding how much of its present contents is original material included in it, and how much of later addition. The parashiyot formed the framework that was to contain the exposition of a number of Biblical verses in continuous succession. But with the notoriously loose construction of the haggadic exegesis it became easy to string together, on every verse or part of a verse, a number of rambling comments; or to add longer or shorter haggadic passages, stories, etc., connected in some way with the exposition of the text. This process of accretion took place quite spontaneously in the Bereshit Rabbah, as in the other works of the Talmudic and Midrashic literature; between the beginning and the completion of these works—if ever they were completed—a long period elapsed during which there was much addition and collection. 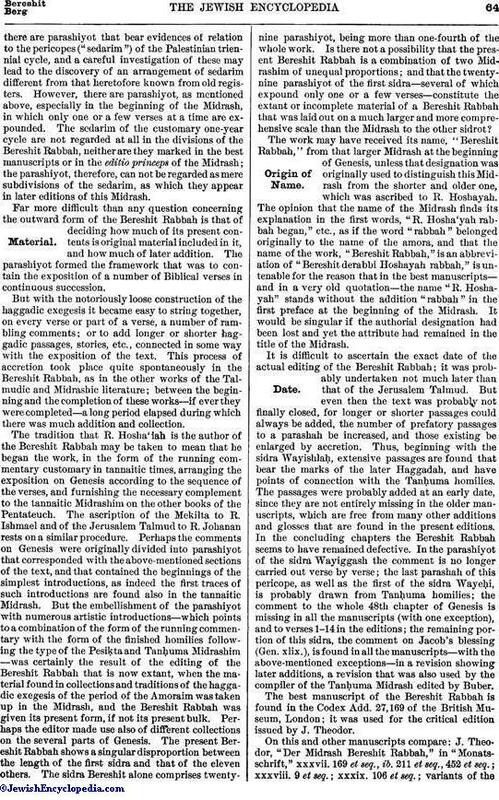 The tradition that R. Hosha'iah is the author of the Bereshit Rabbah may be taken to mean that he began the work, in the form of the running commentary customary in tannaitic times, arranging the exposition on Genesis according to the sequence of the verses, and furnishing the necessary complement to the tannaitic Midrashim on the other books of the Pentateuch. The ascription of the Mekilta to R. Ishmael and of the Jerusalem Talmud to R. Johanan rests on a similar procedure. Perhaps the comments on Genesis were originally divided into parashiyot that corresponded with the above-mentioned sections of the text, and that contained the beginnings of the simplest introductions, as indeed the first traces of such introductions are found also in the tannaitic Midrash. But the embellishment of the parashiyot with numerous artistic introductions—which points to a combination of the form of the running commentary with the form of the finished homilies following the type of the Pesiḳta and Tanḥuma Midrashim—was certainly the result of the editing of the Bereshit Rabbah that is now extant, when the material found in collections and traditions of the haggadic exegesis of the period of the Amoraim was taken up in the Midrash, and the Bereshit Rabbah was given its present form, if not its present bulk. Perhaps the editor made use also of different collections on the several parts of Genesis. The present Bereshit Rabbah shows a singular disproportion between the length of the first sidra and that of the eleven others. The sidra Bereshit alone comprises twenty-nine parashiyot, being more than one-fourth of the whole work. Is there not a possibility that the present Bereshit Rabbah is a combination of two Midrashim of unequal proportions; and that the twenty-nine parashiyot of the first sidra—several of which expound only one or a few verses—constitute the extant or incomplete material of a Bereshit Rabbah that was laid out on a much larger and more comprehensive scale than the Midrash to the other sidrot? The work may have received its name, "Bereshit Rabbah," from that larger Midrash at the beginning of Genesis, unless that designation was originally used to distinguish this Midrash from the shorter and older one, which was ascribed to R. Hoshayah. 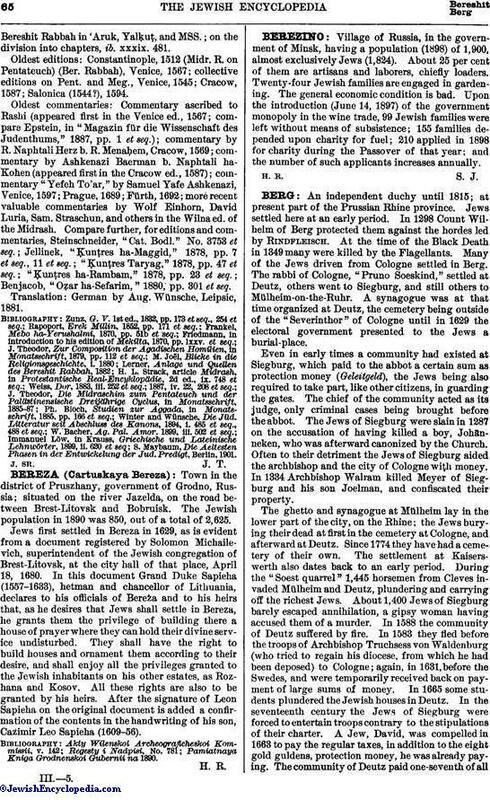 The opinion that the name of the Midrash finds its explanation in the first words, "R. Hosha'yah rabbah began," etc., as if the word "rabbah" belonged originally to the name of the amora, and that the name of the work, "Bereshit Rabbah," is an abbreviation of "Bereshit derabbi Hoshayah rabbah," is untenable for the reason that in the best manuscripts—and in a very old quotation—the name "R. Hoshayah" stands without the addition "rabbah" in the first preface at the beginning of the Midrash. It would be singular if the authorial designation had been lost and yet the attribute had remained in the title of the Midrash. It is difficult to ascertain the exact date of the actual editing of the Bereshit Rabbah; it was probably undertaken not much later than that of the Jerusalem Talmud. But even then the text was probably not finally closed, for longer or shorter passages could always be added, the number of prefatory passages to a parashah be increased, and those existing be enlarged by accretion. Thus, beginning with the sidra Wayishlaḥ, extensive passages are found that bear the marks of the later Haggadah, and have points of connection with the Tanḥuma homilies. The passages were probably added at an early date, since they are not entirely missing in the older manuscripts, which are free from many other additions and glosses that are found in the present editions. In the concluding chapters the Bereshit Rabbah seems to have remained defective. In the parashiyot of the sidra Wayiggash the comment is no longer carried out verse by verse; the last parashah of this pericope, as well as the first of the sidra Wayeḥi, is probably drawn from Tanḥuma homilies; the comment to the whole 48th chapter of Genesis is missing in all the manuscripts (with one exception), and to verses 1-14 in the editions; the remaining portion of this sidra, the comment on Jacob's blessing (Gen. xlix. ), is found in all the manuscripts—with the above-mentioned exceptions—in a revision showing later additions, a revision that was also used by the compiler of the Tanḥuma Midrash edited by Buber. The best manuscript of the Bereshit Rabbah is found in the Codex Add. 27,169 of the British Museum, London; it was used for the critical edition issued by J. Theodor. On this and other manuscripts compare: J. Theodor, "Der Midrash Bereshit Rabbah," in "Monatsschrift," xxxvii. 169 et seq., ib. 211 et seq., 452 et seq. ; xxxviii. 9 et seq. ; xxxix. 106 et seq. ; variants of theBereshit Rabbah in 'Aruk, Yalḳuṭ, and MSS. ; on the division into chapters, ib. xxxix. 481. Oldest editions: Constantinople, 1512 (Midr. R. on Pentateuch) (Ber. Rabbah), Venice, 1567; collective editions on Pent. and Meg., Venice, 1545; Cracow, 1587; Salonica (1544? ), 1594. Oldest commentaries: Commentary ascribed to Rashi (appeared first in the Venice ed., 1567; compare Epstein, in "Magazin für die Wissenschaft des Judenthums," 1887, pp. 1 et seq. ); commentary by R. Naphtali Herz b. R. Menaḥem, Cracow, 1569; commentary by Ashkenazi Baerman b. Naphtali ha-Kohen (appeared first in the Cracow ed., 1587); commentary "Yefeh To'ar," by Samuel Yafe Ashkenazi, Venice, 1597; Prague, 1689; Fürth, 1692; more recent valuable commentaries by Wolf Einhorn, David Luria, Sam. Straschun, and others in the Wilna ed. of the Midrash. Compare further, for editions and commentaries, Steinschneider, "Cat. Bodl." No. 3753 et seq. ; Jellinek, "Ḳunṭres ha-Maggid," 1878, pp. 7 et seq., 11 et seq. ; "Ḳunṭres Taryag," 1878, pp. 47 et seq. ; "Ḳunṭres ha-Rambam," 1878, pp. 23 et seq. ; Benjacob, "Oẓar ha-Sefarim," 1880, pp. 301 et seq. Translation: German by Aug. Wünsche, Leipsic, 1881. S. Maybaum, Die Aeltesten Phasen in der Entwickelung der Jud. Predigt, Berlin, 1901.